About four and a half miles northeast of Marion, KS there exists a piece of land which features plenty of trees, a creek aptly named Clear Creek, and a lot of history. 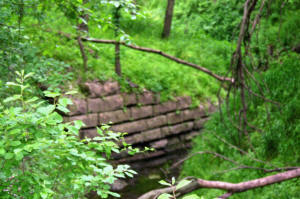 The creek is fed by perhaps a hundred springs, but the history surrounds other nearby mineral springs. According to some accounts mention of this land first appeared in a journal by Zebulon Pike from his 1806-1807 expedition to Colorado. Further, the name for the land is attributed to a "Great Osage Chief" named Chingawasa, who was a signatory of a famous treaty in 1825 at Council Grove, KS. The treaty was instrumental in the establishment of the Santa Fe Trail. There is some conjecture that Chingawasa was actually a great Kaw Chief, but that is not the focus of this article. This story is about a railroad. In the late 1880s Marion locals recognized the beauty of this area and the potential for making the mineral springs into a health spa, which would use the waters to treat chronic diseases such as ailments of the kidneys, rheumatism, skin and blood diseases, dropsy, paralysis, liver complaints, chronic constipation, hemorrhoids, nervous and general debility and female weakness (whatever that is or was). A sanatorium was operating at the site by July, 1888 with hopes of attracting people from all over the west. 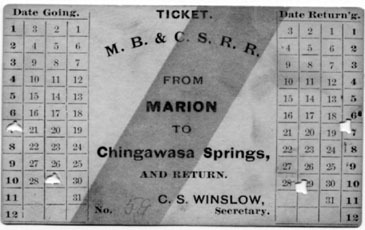 The wonderful idea for a railroad to connect Marion with the Chingawasa Spings was introduced in 1889 and, despite forewarning from the Kansas governor to avoid municipal bonds for funding anything other than schools, the idea progressed. A charter was approved in January 1889, granted for a period of 99 years. The business plan for the railroad was splendid. Several local stone quarries existed in the area, one being adjacent to Chingawasa Springs. Hauling passengers to and from the the spa in addition to quarried rock to the Santa Fe and Rock Island railroad interchanges in Marion seemed a marriage that couldn&apos;t fail. A ticket issued on the first day of operation of the railroad, July 29, 1889. It was written that 2,500 people rode the trains that first day, never again to be equaled. Historic images courtesy of the Marion County Museum. Construction began on May 10, 1889 and the last rail was laid on July 21. 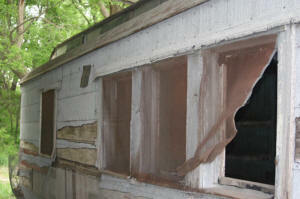 The first train ran over the four and a half mile route on July 29, 1889. A hotel was built near the site of the spa at Chingawasa Springs, and a depot and eatery as well. In fact, both Santa Fe and Rock Island offered round trip fares from Chicago and points west, to include Chingawasa Springs. 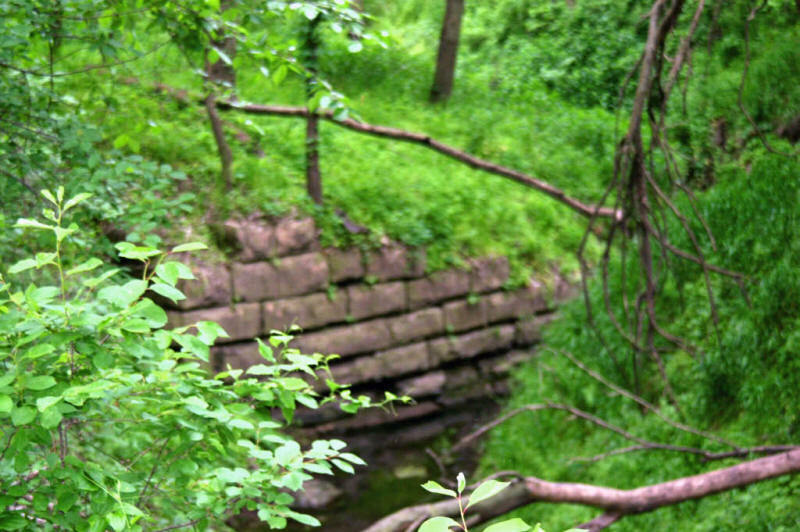 One of two abutments for the bridge where the railroad crossed Clear Creek just a few yards from the end of the run. Contemporary photos by Denny Custer. One reason for my enthusiasm about this story is that my grandfather's brother lived in the only home at Chingawasa Springs during the time of the railroad. My wife and I were able to visit Marion in May of 2005 and, thanks to a very special Marion couple, were able to tour this now private property. We found the foundation for my great-uncle's home and the foundation for Quarry School where his wife was a teacher. We also visited another school at which she taught at nearby. It was built in 1885 and still stands, intact. As part of this visit, I had a chance to drink from the springs below the home, saw the walls of the barn that was a part of my great-uncle's farm ( i.e. they were tenant farmers), and saw two abutments still in place from the old MB&CS railroad. A picture of the passenger car that served as the Owl Cafe for years. 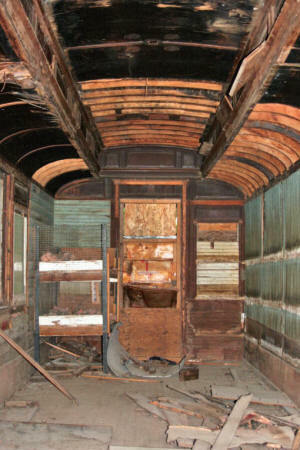 Getting back to the railroad, it owned some cars to carry stone and it also owned two passenger cars, one of which still exists today. 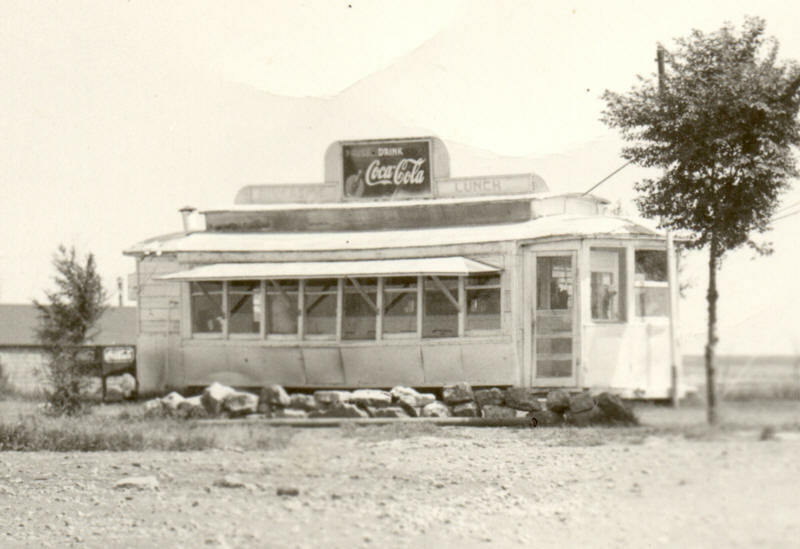 Past articles from the Marion newspaper indicate that one of the cars was used as the Owl Caf� before later being moved to make room for a service station (now Marion Auto Supply). Its fate is unknown. The other car was used by a Dr. C. C. Jones as a dentist&apos;s office and subsequently ended up as an outbuilding on the Henry Holub farm, 6 miles northwest of Marion. 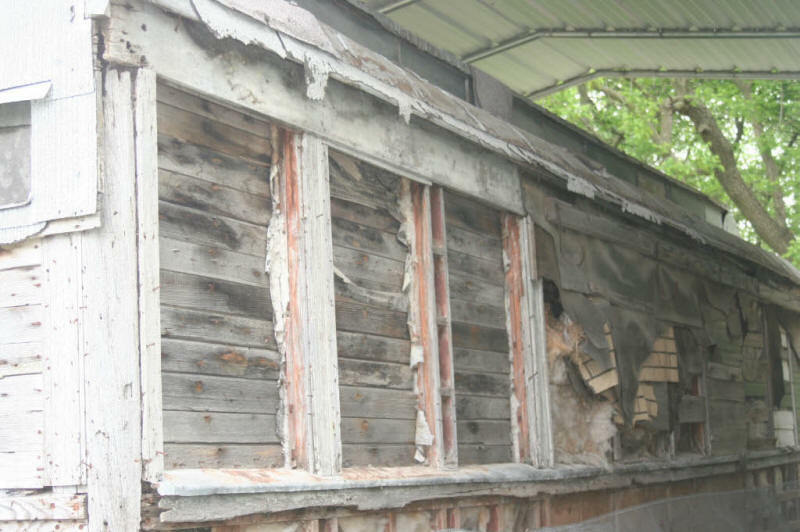 This car that was acquired by the City of Marion a few years ago with the grand idea of restoring it. 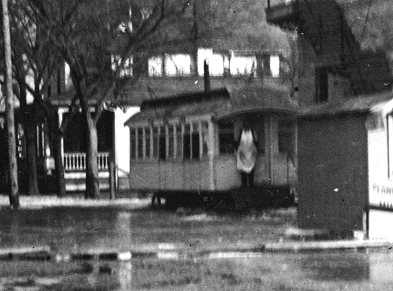 A distant view picture of the surviving MB&CS car "in the flood of 1910 " while it served as the dental office of Dr Jones. Unfortunately, efforts to raise funds and do the work were not successful, and the City of Marion was prepared to destroy the car in August of 2005. There was a flurry of activity from May to August, in which I was very much emotionally involved, trying to save the car. No joy. However, in response to an article in the Marion newspaper, the Orphan Train Museum has acquired the car and moved it to their base in Concordia, KS. Thankfully, their plans are to restore it. She still has life! 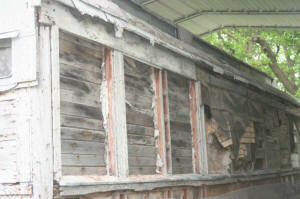 The passenger car sat for several years, in Marion, KS underneath a lightweight covering to protect it from the weather. Underneath the sheathing and shingles (added while on the Holub farm) much of the original structure and exterior details survive. One of the problems in moving forward with a restoration is that precious little is known about the car. Much of the original body and details survive and, combined with the historic photos, this at least gives a good indication of the car's configuration and exterior appearance. However, nothing is known of the trucks the car used. And inside, although much of the structural framing and a few of the interior panels survive, there is little insight as to the car's interior layout, including the seating arrangement, the seats used, the windows, etc. A close up of the ceiling panels shows the scrolling art of that period. 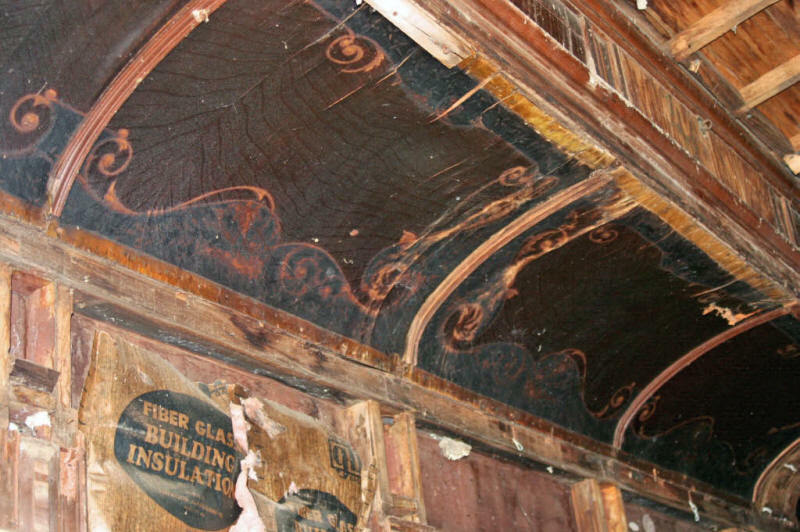 The car's interior is a combination of a "mess" with just enough structural clues to make a preservationists heart flutter. Newspaper accounts indicate the railroad was standard gauge. This is somewhat at odds with the diminutive size of the passenger car, being only 8' 3" wide and about 35' long. But, in the absence of any written reports, or other evidence, indicating narrow gauge, standard gauge seems the most likely. 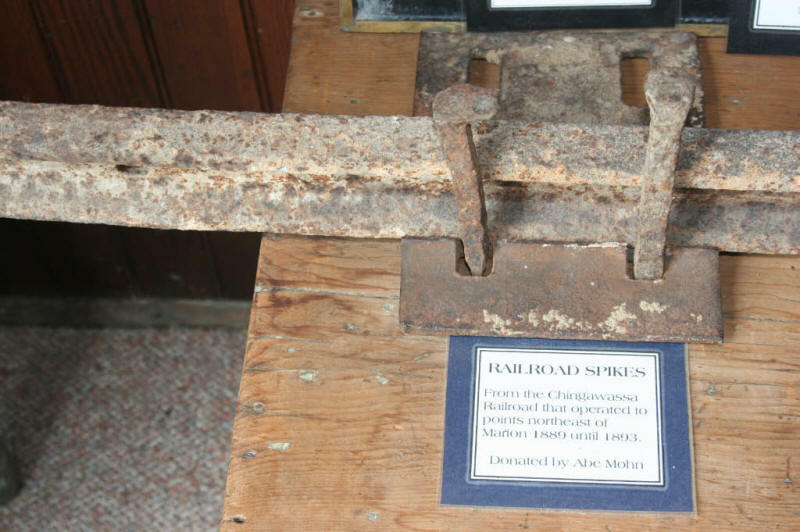 The Marion County Museum has a few pieces of the original rail and some spikes and they are very lightweight. The newspaper reports also mention a single locomotive, "...... one steam dummy engine, a 30 hp coal burner and two passenger cars.". The engine had no head end or tail end and there was no turntable at the Springs, just a switch track. 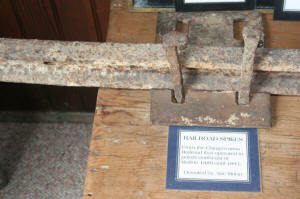 This shows a section of the lightweight rail used by the MB & CS RR. ( If it ever becomes helpful to know the weight, I'll have it measured and weighed). The plight of the folks at Concordia is the lack of pictures or plans of the interior of the car. 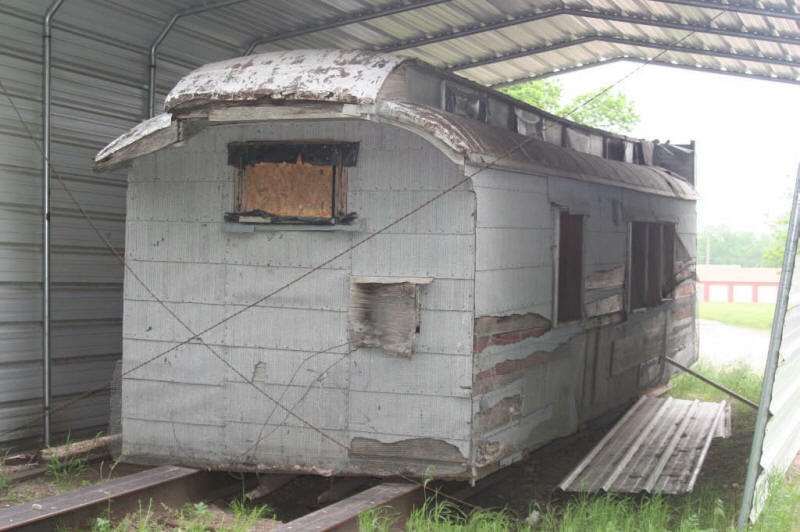 Since the railroad construction lasted only 3 months it seems unlikely the two passenger cars were homemade. However, this conclusion is anything but certain. Another possibility is the cars were hand-me-downs. If this was the case, and if the origin of the locomotive and/or cars were known, it might open avenues for obtaining further information. The Orphan Train Museum and the author have contacted several railroad museums and historical societies seeking data, so far to no avail. Therefore, if any readers of this article have any ideas, clues, people or potential sources which may be worth pursuing, they are encouraged to contact the author via email at dennycuster@comcast.net. Or, alternately, write to Denny Custer; 4381 Calgary Blvd, Okemos, MI 48864, or call at 517-349-2822. Any leads offered will be most appreciated.